Since the inaugural mother-daughter Stitch Fix experiment went so swimmingly, we decided to try it again. For the second time, Piper’s stylist did a great job. It was one of those fixes where you start rationalizing keeping it all as soon as you open the box. But, with a budget of $100 decisions will have to be made. What’s this Stitch Fix thing you keep rambling on about? Let’s take a look at what she got this month. First, out of the box was this adorable outfit. The Ishya Halter Blouse by Collective Concepts and the Cathleen Crochet Short by La Class. This top is fully lined and the neckline is adjustable with a tie in the back. The shorts have a flat, elastic waistband, stretchy fabric and the scallop hem that is so popular this year. Here’s a close up of the shorts, since the previous pic does not do their cuteness justice. Next, was this Liverpool Denim Cross Front Frayed Hem Shirt. Good news, bad news situation here. Good news, it’s Liverpool so the quality and style are amazing. Bad news, the price will make you weep. Piper loved this shirt from the moment she laid eyes on it, so this will make the final decision tough. Then there was this Paloma Emboidered Trim Skirt by 41 Hawthorn. Piper told her stylist she wanted to upgrade her clothes to look a little more put together, this skirt certainly fits that bill. The fabric is amazing, you would not believe how stretchy and wrinkle resistant it is. While the skirt is fantastic, it’s not really something she has much cause to wear; and it’s pricey so I’m pretty sure it’s not staying. Finally, these little gems. The Gorjana Power Gemstone Studs. So cute, but probably are not in the budget so let’s not get attached to them either. So what’s the damage? Let’s find out. I gave her a budget of $100, anything over that she is going to have to earn and/or pay for herself. She loved the denim shirt, lace shorts and printed top. She liked the skirt and earrings, but choices have to be made. Without the discount the three items she wanted were $166. With the discount, $124. Then deduct the styling fee and you are at either $146 or $104. With the “buy it all” discount she was really close to budget. Time to make a deal with Mom. Here’s what happened. First, we listed the skirt and earrings on Facebook trying to sell it on the Stitch Fix forum, no luck. In the meantime, I tried on the skirt and realized it would work in my wardrobe really well. Ultimately I bought the skirt, and she agreed to work off the $28 for the earrings, everyone was happy and peace was restored to the kingdom. So, Teen Fix #2 = success. 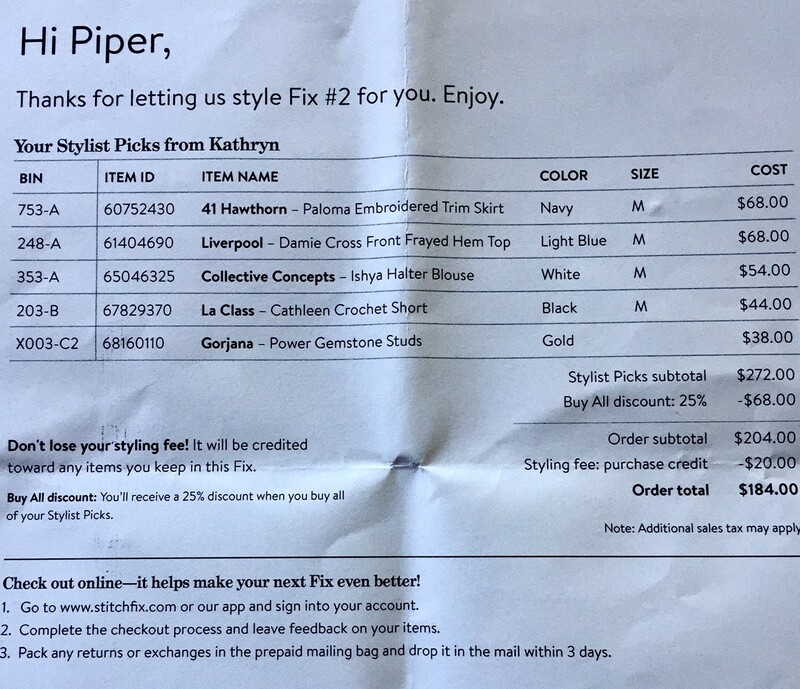 If you have a teenage daughter (or son, they do have Fixes for guys) I highly recommend giving Stitch Fix a try, it would make a great back to school gift and possibly spare you the agony of standing outside a dressing room for hours on end at your local Target. Want to try Stitch Fix? Here’s how to get a $25 credit on your first Fix, seriously $25, no joke. If you want to try Stitch Fix, PLEASE use a referral code when you set up your profile. (don’t be a chump like me) You’ll get a $25 credit towards your first Fix. You don’t have to use my link, but please use someone’s. However, if you would like to use mine, I would be thrilled. You don’t have to order your first Fix right away. You can set up your profile and let them know your preferences and budget. When you are ready, you’ll schedule your first Fix. You will also be given your own referral code that you can give to your friends and get a $25 on your account, so please share the love.